And I Am Not Lying » Blog Archive » I Hope the Walls Stay Dry: And I Am Not Lying Live at The Black Cat in Washington, DC. I Hope the Walls Stay Dry: And I Am Not Lying Live at The Black Cat in Washington, DC. 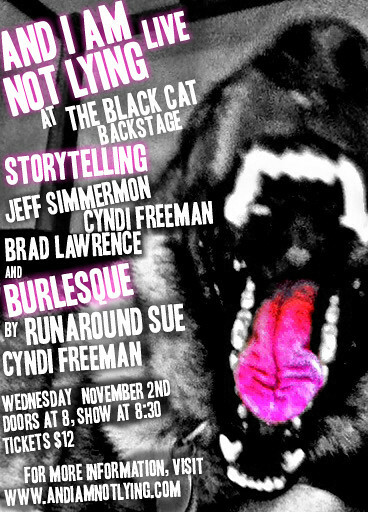 On Wednesday, November 2nd, 2011, I am going to be performing along with my troupe of storytellers and burlesque performers at the Black Cat in Washington, DC. It’s going to be me (Jeff Simmermon) as a storyteller, along with And I Am Not Lying members Cyndi Freeman and Brad Lawrence, along with additional burlesque by Runaround Sue and Cyndi Freeman as Cherry Pitz. Tickets are $12, show starts at 8PM. And I honestly cannot believe that I just standing here in my office, typing this like it’s the most normal thing in the world. We used to sneak off to the Black Cat in high school and college all the time, to pretty much see everybody. It was the beacon on the hill, the magnet in the big city that produced Bad Brains, Fugazi, Nation of Ulysses and God knows how many other bands — many of which contained my friends that I secretly admired but never told because I was so jealous — and sucked me right up there. I hung out there all the time in the years that I lived in DC, and now I’m thrilled and terrified to be a tiny part of the continuum that made me. Imagine if you ate at incredible potlucks for your entire life, full of incredible, nourishing delicious everything you could possibly imagine and then found all these new things you didn’t ever know existed but blew your mind apart all the same. When it comes your turn to put a dish on the table, you just really hope it doesn’t make people barf on the walls, is all I’m saying. I am nervous enough to barf on the walls right now. I started this blog in Washington, DC as well, and it’s going to be a pretty weird homecoming. I sure hope you folks can make it.